By capturing your initial Manufacturing Critical-Path Time may subsequently the improvements resulting from the changes in the production environment, and how to reduce your turnaround successfully be made visible. 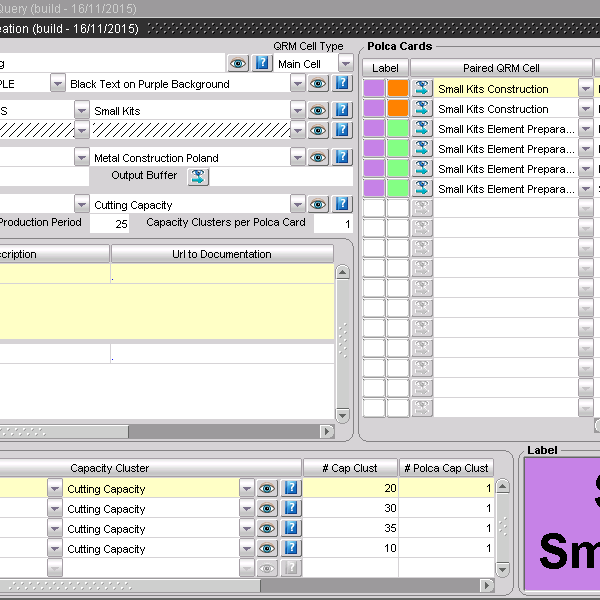 Your objective in implementing QRM is to reduce the lead time. The concept of MCT (Manufacturing Critical Path Time) gives an unambiguous definition turnaround to the concept, which also some less obvious tijdvreters be charged. Since the MCT-reduction is achieved by eliminating “waste” in terms of time, it is important to gain an understanding of the processes with a view to processing time and the proportion of such as ‘waste’ (whitespace) can be considered. QRM therefore introduces a simple drawing technique which makes in a glance what time consumption of a process, which sub-processes there are on the critical path (shading) and where to obtain the most room for improvement falls (whitespace). Even stock and WIP are white space but of a different order. To make this clear, we put it into the tool in blue. In order to enable a continuous process (MCT-reduction), it of course is not sufficient to draw a single-MCT-Map. At regular intervals to be remeasured each MCT and compared to the original starting point. 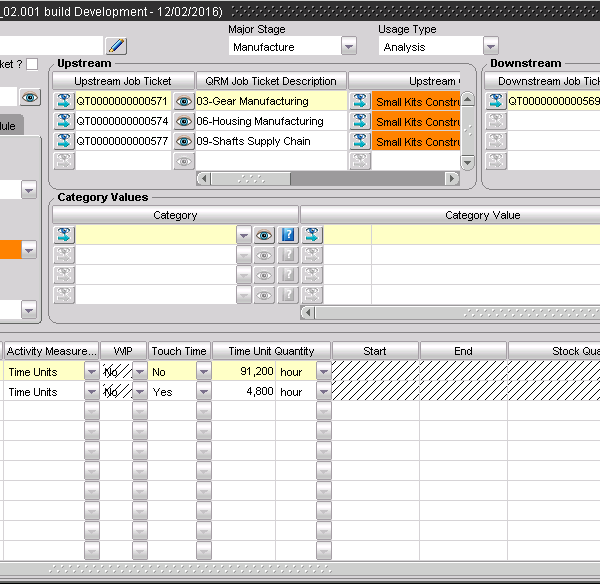 This can be done by repeating the manual exercise periodically, but also because the tool is able to MCT-Maps to make each of the planned and actual order flow, it is possible to monitor the reduction of the MCT-progress permanent. 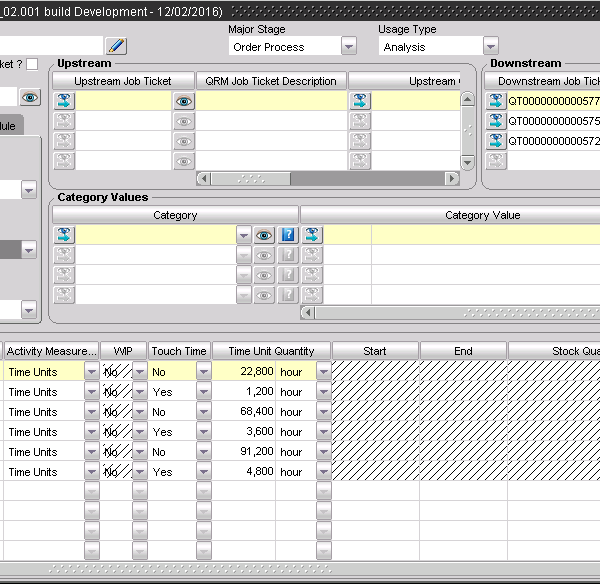 The tool compares the “as-is’ situation, but it is also interesting to compare the MCT in the actual order flow with what was planned. If such a comparison shows a clear structural abnormalities (both positive and negative), this is an indicator to adjust the parameters (lead times) at the system level. This in turn creates a traditional plan-do-check-act cycle of improvement. 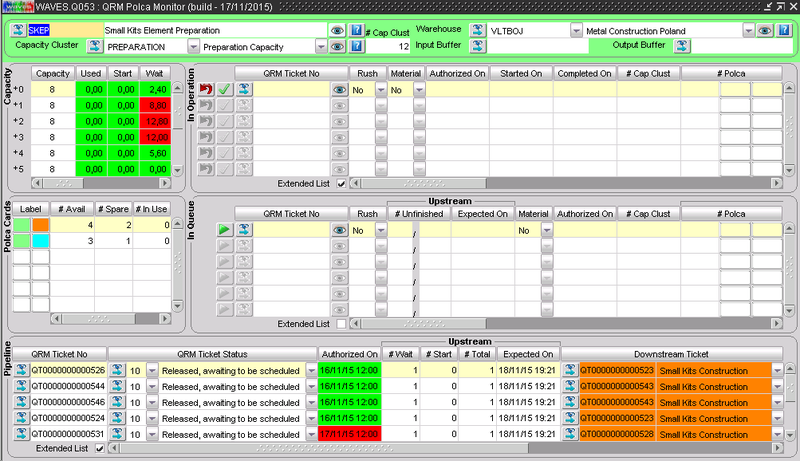 This QRM tool gives you real-time insight into your available and allocated capacity, so orders – with their respective routing throughout the organization – even in real time in your schedule can be included. By shortening the turnaround automatically removes the need for (long-term) planning. What does not disappear, it is the obligation of the customer when placing his order to ensure proper delivery time. 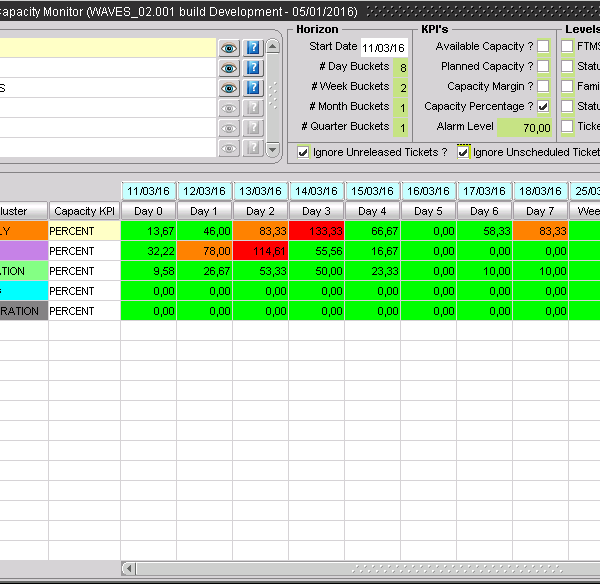 Because the existing ERP / MRP solutions adapted from the classic (often batch oriented) planning methods – in which one tries to arrive at a ‘doable’ planning in several cycles – they are usually less able to provide real-time insight into both capacity and material requirements . QRM focuses on reducing the processing time by eliminating whitespace (time where nothing happens with the products) and is much less interested in the detailed and therefore lengthy description of all time elements only touch time (gray space) try fixed to lay. 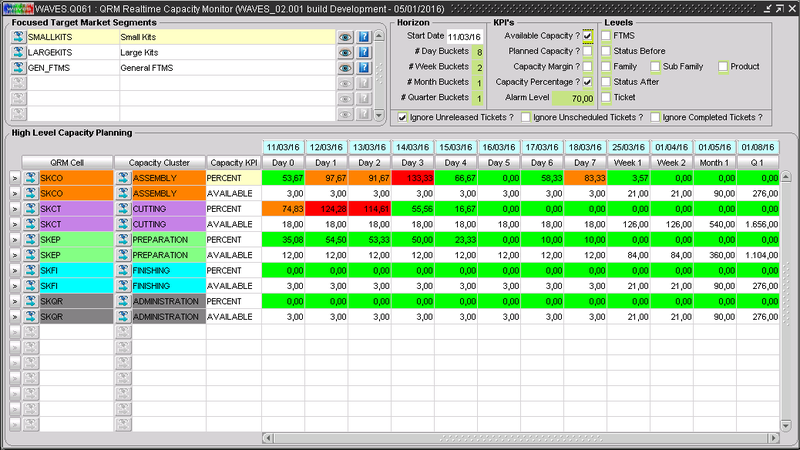 To be able to identify available and required capacity, it will be set at a much higher and more abstract level. 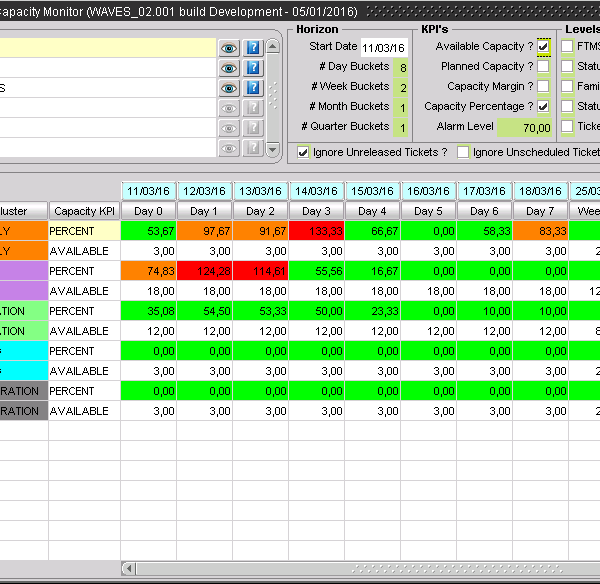 This reduces to define the number and therefore to maintain capacity parameters drastically. Because there are far fewer parameters are involved, it is also much easier by periodic analysis and adjustment of parameters to learn the system. On the basis of this high-level capacity calculation can be immediately made visible, and real time where there will arise in the process bottlenecks. 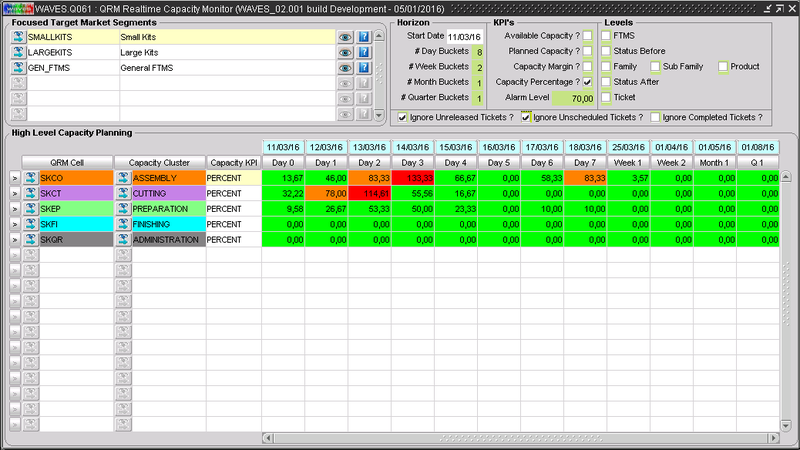 Depending on the chosen time horizon is shown by QRM-cell or sufficient capacity is available (green), where there is reason for concern because the reserve margin is exceeded (orange) and, finally, where there is a very acute problem because the available capacity is exceeded (red). As soon as the bottleneck is, of course, can be zoomed are visible to determine which orders cause the problem of capacity. By, in addition to the real-time understanding of the capacity, to provide the same for the material requirements there is an instrument that makes it possible to check in real time whether the date of delivery requested by the client is attainable. 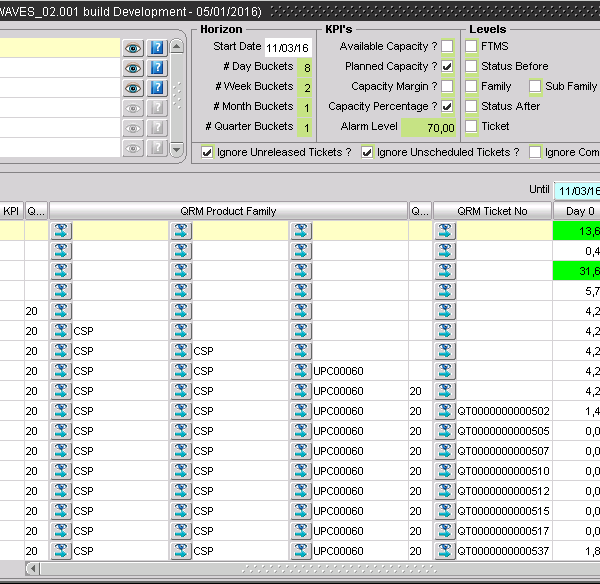 A first step towards QRM while maintaining the existing ERP system can be to implement QRM POLCA. 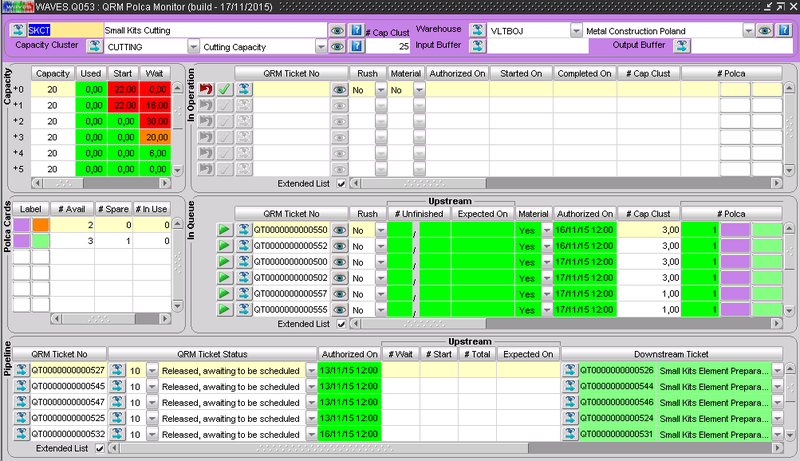 QRM POLCA provides support for the shop floor control in the QRM-cells work on the basis of the POLCA-card system. 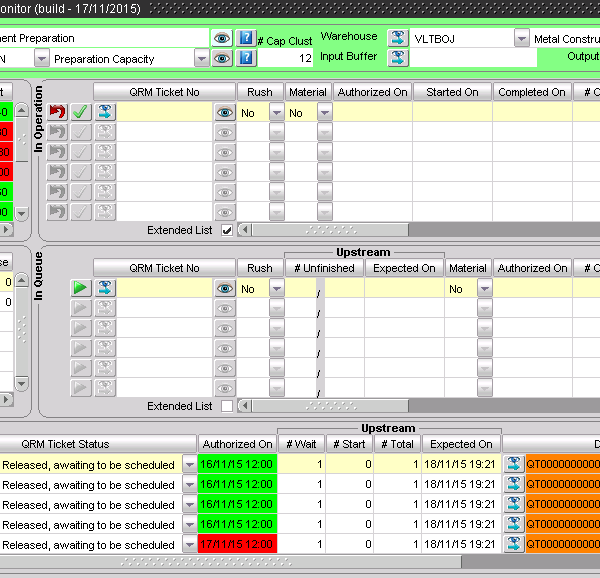 QRM each cell gets POLCA cards available, and thus also available capacity for transmitting orders to the next downstream QRM cells. As soon as all the tickets for a certain downstream cell are in use, the cell may not start more orders which the affected downstream cell as the next cell have in the process. 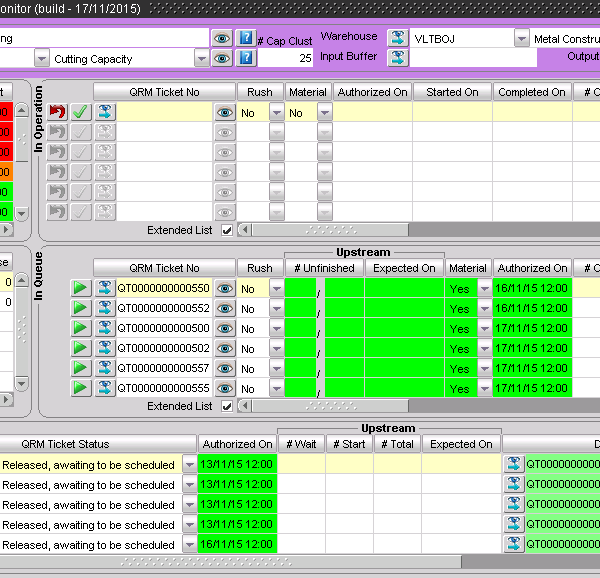 queues are avoided in this way and can only continue a cell of orders (or tasks) that follow a different routing. The employees of each cell have QRM on the basis of its own ‘POLCA Monitor’ full understanding of the work in progress and expected and already waiting orders. The monitor shows itself in addition to the optimal sequence of fulfilling orders, and whether these can be started at all and what is possibly missing. 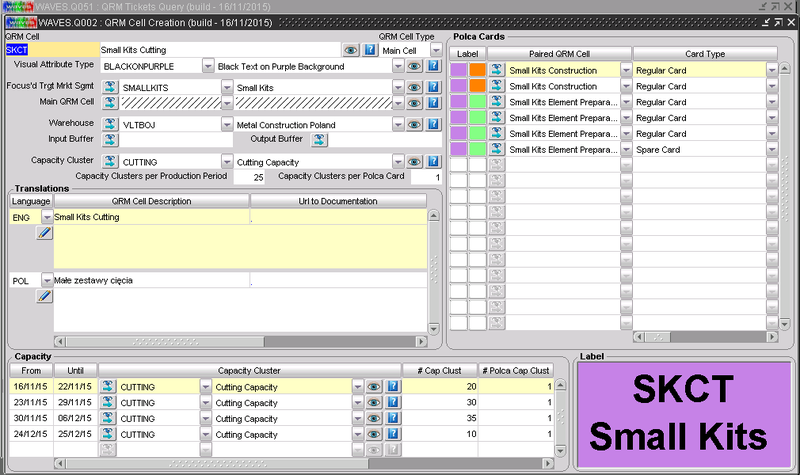 Once an employee an order (or task) starts, the monitor automatically calculates the required amount POLCA cards depending on the order size and assigns them definitively to the task. The assigned POLCA cards will only be released when also has been finished, the next step (downstream), and there hence is released again downstream capacity. Of course, this also always updated in real time the availability of POLCA cards.